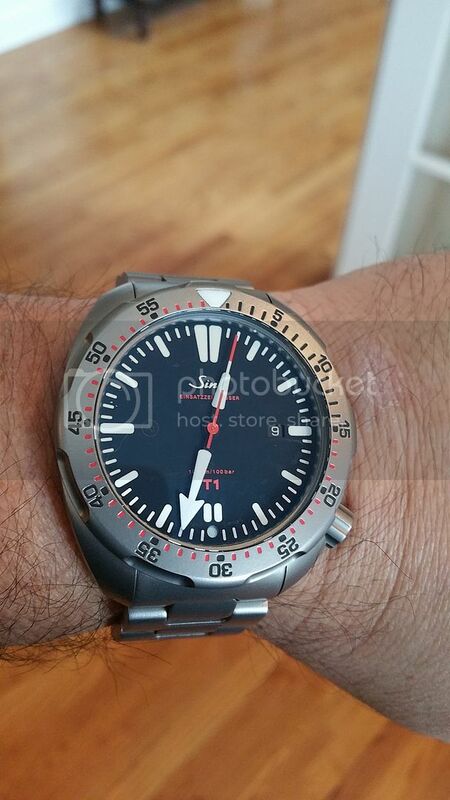 I have never owned a Sinn, but am very interested in the T1. Everything I have read or heard is that it wears smaller than its actual size and that it is a great watch. Any thoughts out there from owners? I went ahead and bought the Sinn T1 EZM 14 with titanium bracelet. Amazing how comfortable and light the watch feels. I'm very happy with the purchase as this will be my daily watch for golf, swimming, etc. (I can give my IWC a rest.) Wow, just noticed how much the photo zoomed in. Guess I should have wiped off the dust before taking the picture. And I like the idea of it being titanium and relatively lightweight. Nice watch. not too familiar with the brand, but i like this one. That has been my experience with Sinn. I haven't owned a T model, which may not be as noticeable given the weight reduction.